Build in a Collins or Highball glass with ice, top with 3 oz ginger beer (Reed's), and garnish with a lemon wheel and a lime wheel (lemon twist). For the cocktail hour two Sunday nights ago, I began flipping through Lou Bustamante's The Complete Cocktail Manual to look for a passed-over gem. 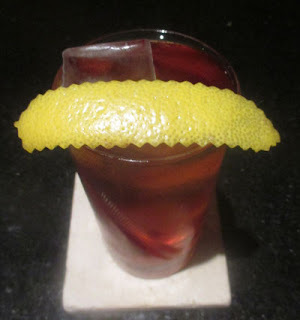 There, I spied the Black Friar Tea by Julian Miller of Tampa's USBG chapter. If I still had Plymouth Gin on my shelves, I would have utilized it here (given the name and the recipe's spirit call), for the distillery took over the Black Friars' monastery as I mentioned in my Plymouth tribute, the Black Friar. I later discovered and made a gin-based Black Friars from an old United Kingdom Bartenders Guild's Approved Cocktails book that was surely a tribute as well despite the lack of gin specification. Here, the recipe came across like a embittered Pimm's Cup crossed with a Fog Horn (gin, ginger ale +/- lime), so I was definitely curious. For the aperitivo, I felt that Aperol would be quite pleasant here, but there was a chance that it could get lost; therefore, I split the volume with Campari. Once prepared, the Black Friar Tea donated a lemon, pine, and fruity bouquet to the nose. Next, a carbonated orange and berry sip was followed by juniper, bitter orange, and ginger flavors on the swallow.